And thank you http://www.quotesdump.com/ for the quote. 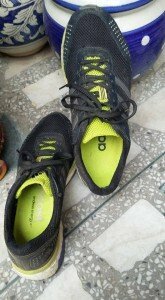 Before I hand you over to the expert charge of Sangeeta Saikia and her review of her current running shoes, let me – by way of introduction – well, quite, let me introduce Sangeeta to you. Actually, I haven’t met Sangeeta other than in cyberspace. 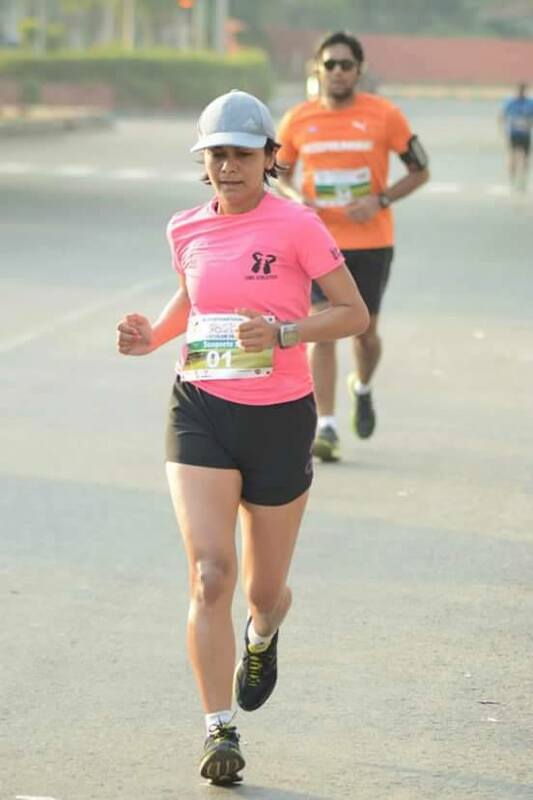 We are both part of a brilliant #100day online running challenge, and Sangeeta is consistently by far and away the fastest woman runner, and people like me can only marvel at her dedication and the number of km she has so far racked up. In her Adiosboost2. So let’s hear her thoughts. I couldn’t wait to take these babies out for a spin ever since the black-and-neon piped version of arguably the ‘fastest shoes in the world’ caught my eye. The adizero family has an impressive roster of wins, with the adios itself claiming the last 4 World Marathon Records broken – and all by different athletes! With the latest iteration in adidas’ new revolutionary boost midsole, the best apparently – got better! What struck me early on is how these Racing flats were engineered for speed. Combining a narrow last with a low stack, the 8 mm heel drop accentuates the feeling of being strapped in for a new PB:) Every time I have laced on these shoes, the feeling has remained irrevocably, the same! Early into the run, it becomes apparent how little time one spends transitioning from strike to take off. The boost foam makes for an interesting paradox. While it is soft enough to take the miles of the unforgiving tar, it is responsive enough to allow for Race speeds. I suspect, the new compound used has let adidas make a Racing Flat with that minimal a drop. 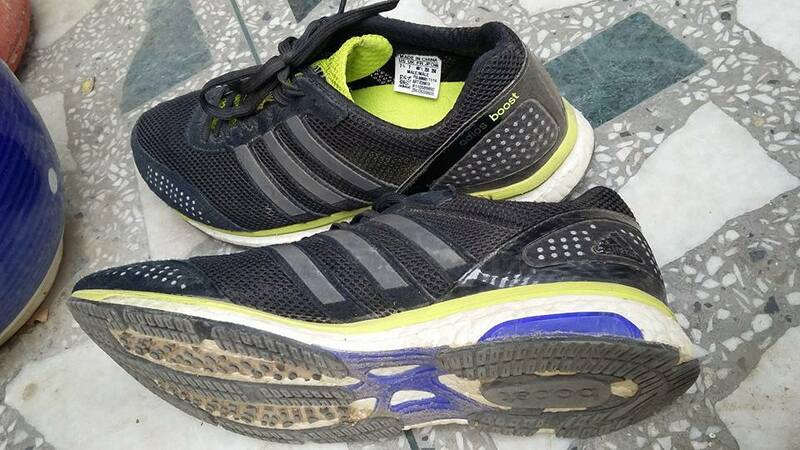 A minimal pair of shoes traditionally has required a runner to have tried-and-erred, and strength-trained enough for calves/ankles/the whole unit to bear his/her body weight bearing down on the feet repeatedly over the miles. Sangeeta, thank you so much for being our first guest reviewer. Now, readers, over to you. Do you have any further thoughts or comments (good or bad) on the Adiosboost2? We would love to hear from you. I did and indeed it is. 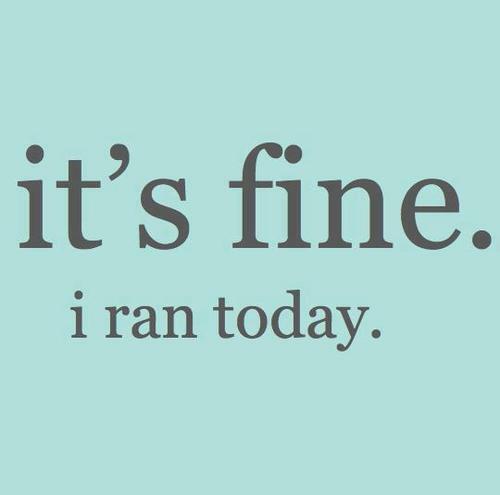 Fine because I ran, I mean. It was hot – 31C at 5.30 am, for crying out loud – but with 2 energetic dogs for company, we all ignored the heat, ran in the forest, and they chased the peacocks•••, and I filled my heart and soul with happiness for the day. And thanks to http://www.quotessays.com/run.html for the quote of the day. But I’ll tell you now, free gratis and for nothing, that everything will be better later. After that run. Cure for all ills, this brilliant running business. And note to self : next time you wake up tired, stop moaning and get out there and run. 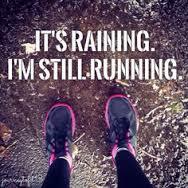 Is there another sport that has as many motivational quotes and uplifting sayings as running? Not that we any of us need such quotations, of course …:) Still, there are so many great quotes out there, that I think we can happily check some of them out. I’m kicking off with one that sums me up perfectly. 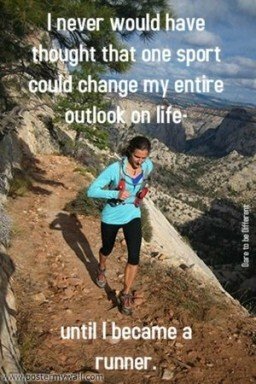 Running has changed me and my life and my priorities. Totally and utterly. On any given day, running is what shapes my day and the way I apportion my time. No two ways about it. What time I get up, go to bed, what and when I eat – all are weighed against my need to run. 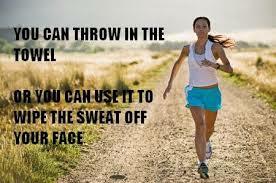 Thanks to http://www.jenisgreen.com/2013/02/18/some-running-motivation/ for the image. To stretch? Or not to stretch? 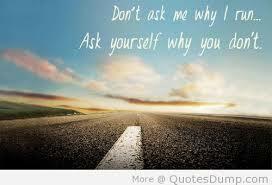 And, dear readers, it’s one which I am asking you all to help me answer. As a still-finding-my-way-newbie runner, there are many basic things about which I’m unsure. Like, actually, seriously, how important is stretching before and/or after a run? Do you all stretch before even what you know is going to be a short run? Since the man with whom we started running and training 18 months ago is a tad indifferent about stretching, it’s not a habit I have taken on board. When I feel the need to stretch, I do so, but it’s not a religious pre-run ritual. Between you, me and the gatepost, when I see people furiously stretching away before races, I get rather intimidated. Oh heck, they clearly know so much more than me/are going to be way way fitter – that kind of thing. Another reason for skipping the stretches is the desire to run and not “waste” precious run time, especially if time is limited. (Cue for you to tell me that stretching is not a waste of time…) Now, more than ever, in our brutal Delhi summer, any time spent stretching means less running time before the sun gets too fierce (which it did this morning, a propos of nothing). I almost never remember to stretch after a run. I’m either dashing to the car to escape the sun (& give my dogs water) or dashing to the loo, or some such, and stretching gets forgotten. However, having said that, after the brilliant SCMM this January, the women finishers were ushered into the most amazing holding area where we were gently ordered to stretch by utterly charming and uber fit young things, and you know what? Ne’er an ache or a pain the next day…so there probably is something to be said for stretching after a long run. I went online to find these photos (photo credits are down below, at the end of the post) and of course there are pages and pages and yet more pages of recommended stretches. There are lists galore of the 6 most important stretches/10 best yoga positions/whatever…and so now I’m all confuddled and bemused. OK, OK – I think I might just have answered my own question through writing this post. Yes, I probably should be stretching more. What I would love to hear from you, would be your suggestions as to which are the most effective stretches, pre- and post-run. And – is there a recommended order for doing stretches? A sort of logical progression from top to bottom of one’s body, for example? Or does it not actually matter in which order one stretches? Photo Credit: lululemon athletica // introducing… ask a runner! And here am I, the wrong side of 60 (just) and occasionally feeling young and more often feeling old, and wondering whether “at my age” I should be pounding the pavements. 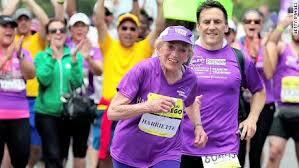 Read about the inspirational Harriette Thompson, who just happens to be a cancer survivor and a concert pianist. And a grandmother. And a recent widow. 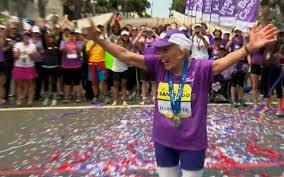 And who started running marathons when she was 72. 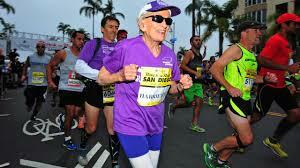 Now if this lady isn’t an inspiration to every one of us to get off the couch and out of the door, I don’t know what is. And if any of you ever hears me try and squeeze admiration/sympathy/understanding out of you by playing the age card – kindly remind me of Harriette, and send me on my way. How many gadgets is too many for a runner? As I tumble out of bed at first light to go running, these oh-so-hot Delhi summer days, once I’m dressed & caffeinated, I have a checklist that I quickly run through (no pun intended). I thought I’d run this list past you (no pun intended), and ask for your thoughts. 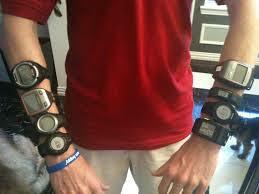 Are we runners all getting a tad over-gadgeted? Or is it just me? Am I carrying too much stuff? Here’s my list of extras, over & above the car key & the house key. Too much? Or is this pretty much standard kit for you, too? Hey, I could be worse, like this bloke. (b) I can take photos of the amazing things I might encounter while running. (c) it has my music on (hence the headphones) AND a nifty running app that maps my route and calculates my distance (mapmyrun) and tells me how many miles are left to run on my lovely new shoes. So if I have such a nifty mobile running app, I hear you say, why the need for a Fitbit and a GPS? Well, the former doesn’t weigh a thing – that’s my excuse. And the GPS is a backup against the phone app not working/phone battery running low. 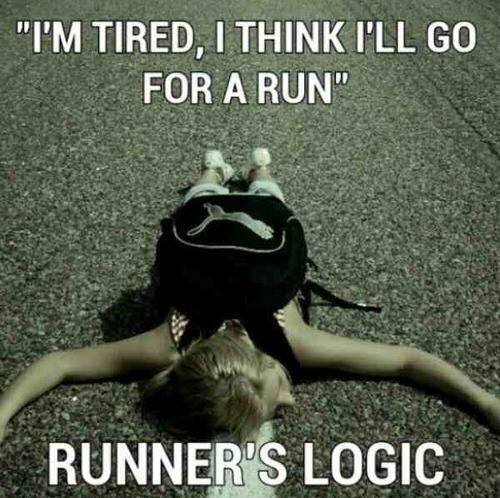 Which has happened on several occasions, usually on super long runs. The theory is, that for longer distances, I use the Garmin not the phone app, to preserve the battery for all that uplifting music, so I have to be totally comfortable with both. 1) I do worry that having so much clobber might attract undesirable attention. Having been groped twice whilst out running alone, I know I should also carry my pepper spray, but I’m still a bit lazy about it. 2) It’s surely not good for running posture is it, to have stuff in both hands? 3) The day I fall (again) everything will go for a toss and I’m not sure my iPhone will survive a second running accident. Do share your thoughts, but just remember, if we are de-gadget-ed, how will we all be able to upload our track logs and timings and photos? Well, in the good ol’ US of A, that is. Here in India, it’s just another Wednesday. I discovered it was National Running Day from my handy mapmyrun app on my phone, but only after I had come home from my morning run, so it was all a tad too late. As in a pukka heavy downpour for about 10 minutes. After the heat, oh the joy of having to take shelter from the rain…but then the dogs and I continued in the drizzle, too happy to care about getting soaked. Any of you reading this in England (and thank you very much for so doing) – so, yes, you good folks probably cannot even begin to comprehend the joys of rain. I know you were all cyber-grumbling yesterday about the winter weather returning to Blighty, so you’ll just have to take it on trust. The arrival of rain in Delhi is cause for joy. After the 43C of a couple of days ago, to run in 27C…fabuloso. 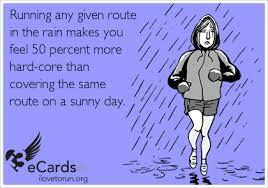 Fellow dilliwalas – and especially my fellow #100daysofrunning friends – your thoughts on running in the rain? Any advice? Precautions? Oh, and by the way, I found these quotes online, in Pinterest. 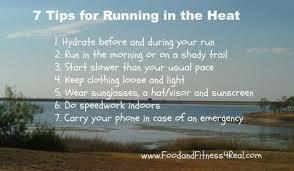 This won’t be a very long post, since I am lacing up my running shoes and about to head out to run. In Delhi’s current 39C summer heat. And why would I do that, you ask? 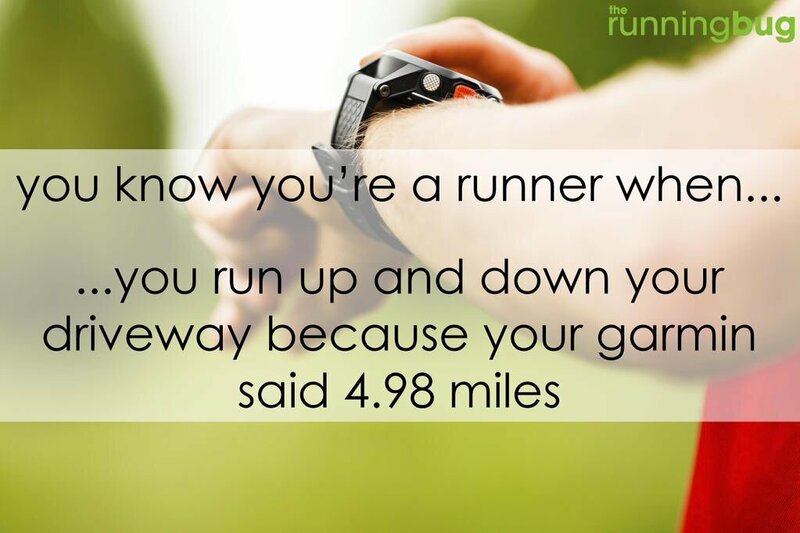 Actually you won’t ask, because most of you are runners. There is a brilliant 100 day running challenge happening online at the moment, and today is Day 33, and I haven’t missed a day thus far and…yes, correct, completely obsessed. 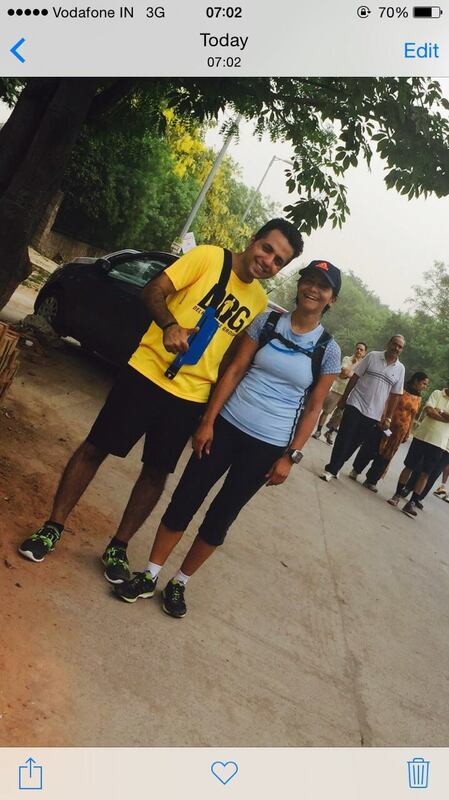 It’s a totally friendly event, with a commitment to run a minimum of 2km per day to stay in the race. Most of us seem to be Delhi and NCR based, but there is one awe-inspiring man in Ahmedabad who runs the equivalent of a marathon every day. Yup. You read that correctly. 42km every day. I’m speechless. Here you go, here’s the link. I don’t know any of the other runners – though there are a couple of people I have met at races – but an amazing sense of community has already built up, as we all post and update our stats every day. For me, this is the longest continuous stretch of time I have run – does that make any sense? Basically, I have never thus far run for 32 consecutive days. Soon to be 33. This challenge is amazingly motivating, and makes me (somewhat) ignore the heat. Off into the heat I go. I found the quotes online, in Pinterest.